Being in the state of ketosis is the goal with this type of diet. In order for faster than average weight loss to occur, along with myriad other health benefits, it’s important to get into the state of ketosis and stay there. How can you determine if you’re in this zone or not? 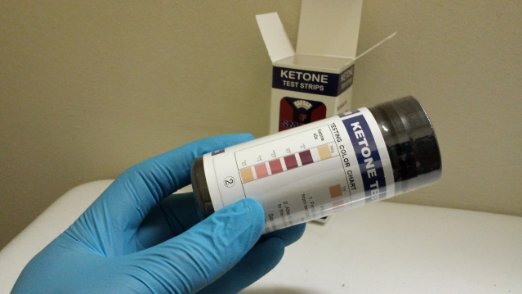 There are several ways to determine whether or not you’re in ketosis. One sure-fire way to know is by using something called Ketostix. Ketostix are small strips you hold in your urine stream for about 15 seconds. The strip will turn purple as an indication that there are ketones in your urine (meaning your body is producing ketones, and you are eating low enough carbohydrates to force your body into ketosis (thus burning body fat for fuel). Although not 100% accurate at all times, they can give you a general idea about your state of ketosis. Many people do use Ketostix as a general way to monitor their progress, but that is not the only method you should use to check results. Ketostix are easy to find and are available at most drugstores, and even many grocery stores, nationwide. Additionally, there are some other, perhaps more subtle, ways to determine if you’re in fat burning mode (ketosis) or still burning carbohydrates for fuel. Some people say they experience a weird taste in their mouths, and some report a slightly unusual scent to their urine. As your body burns fat, the byproduct produced is ketones. The ketone release is the reason for these different tastes and smells since the way your body gets rid of them is through your breath, urine and sweat. You also could feel very thirsty as your body begins to flush itself out. How quickly will you go into ketosis once you begin limiting your carbohydrate intake? It can take as little as 36 hours for many people. Since your body stores glucose (the product of breaking down the foods you eat into blood sugar) not only in your blood stream, but also intramuscularly (within the muscles), the length of time it takes each person to get into ketosis can vary, depending upon how much glucose is currently being stored in your body. Once your body works through those stores, you’ll switch over to burning fat for fuel, and may notice some changes in the way you feel. For starters, your body will begin to release and flush out excess water. You may also experience some less than desirable symptoms as well, but they will pass, so stay the course. Some effects of very low carb dieting may include a feeling of the flu. This is commonly referred to as “ketosis flu” where you simply feel tired and rundown. This can be partially remedied by including more sodium in your diet. The flu-like symptoms should dissipate over a few days as the tiredness, possible nausea, diarrhea and brain fog go away as your body switches over into fat-burning mode.